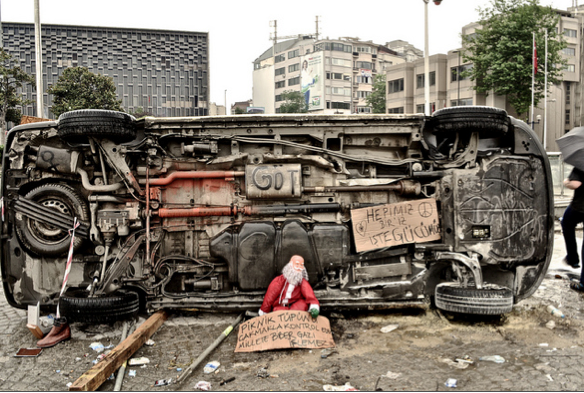 There is no shortage of potent imagery from the Gezi Park movement, which has evolved into a pseudo-1960’s around-the-clock “Be-In” where spaces and resources are shared communally. Though victorious and celebratory, the police-free zone that currently surrounds Taxim Square still carries the scars of the weekend’s turmoil. Overturned cars have become in situ art installations. Vendors peddle corn, simit, and beer on the streets. One bus, its windows smashed out, has been repurposed into a library. And every day thousands of supporters, revelers, and tourists make the pilgrimage to what has become the epicenter of Turkey’s biggest peoples’ movement in years. In many ways the protest today is unrecognizable from the sit-in it began as in the last days of May, before the bulldozers, riot gear, and international attention. Despite this, a photo produced on the fourth day of the protest has emerged as the movement’s first signature image. 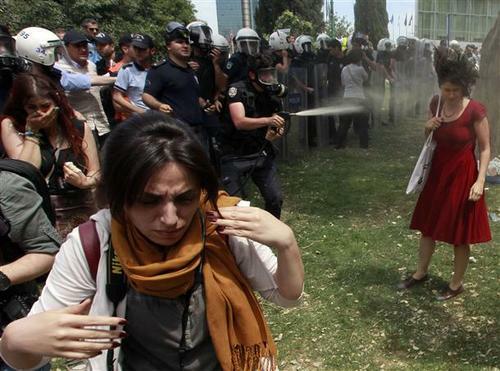 Dubbed the woman in red by Alexandra Hudson of Reuters News Service, the picture immediately went viral in Turkey before being snapped up by multiple news agencies and acclaimed by many as the symbol of Occupy Gezi. What is it about this image that makes it so compelling? Looking at the key elements in the frame, we see two people, a male police officer with a gas mask and a hose that appears to be spraying a female with what we surmise is pepper spray. Her face is a contorted grimace and her hair bizarrely on end. In the left foreground, another female faces the camera. Though she is perhaps unaware of the action behind her, her furrowed brow confirms a physical reaction to the spray. Behind her, a third female covers her mouth and nose with apparent distress. Juxtaposed with the key figure of the woman in red, these women’s intense reactions to second-hand contact with the spray heighten the viewer’s awareness of the anguish that the woman in red must feel. Though this human suffering is certainly enough to invoke viewers’ empathy, additional signifiers convey more subtle meanings which make the image more powerful within the social context from which it is viewed. For starters, the girl’s youth, her red summer dress and her purse or book bag evoke a myth of “the girl next door,” a girl we are at once familiar with and unthreatened by. Indeed, the power of this image lies in just how ordinary the girl looks. She does not fit the stereotypical image of a political activist, but rather appears as a bystander caught up in someone else’s conflict. Perhaps she took a wrong turn on her way home from school or work. Even her body position is inoffensive; with one hand on the purse strap and another at her side, she seems surprised, even defenseless. The subtext of these signifiers – her body language, youth, attire, and gender – make the girl an object of innocence that is instantly relatable and sympathetic. That such a character is subject to such extreme violence without provocation moreover invokes a narrative of victimhood that heightens viewers’ empathy for the girl and provides moral high ground to the protesters. Contrasting with the main officer’s gas mask and the police squad’s tactical riot control gear, the woman in red’s fate appears further unjustified. The heavily armored police squad does not appear to be restoring order to a hostile protest, but stands like a row of pawns in a chess game. Indeed, the absence of provocateurs from the image’s frame, enriched by the empty green space behind the woman in red, suggests that police are the true aggressors, unconcerned and unfettered by the operational standards of proper use of force. These polarizing symbols of innocence and abuse of power imbue the image with an iconic presence. Through an emotional and ethical appeal to viewers’ sense of right and wrong, the woman in red successfully mobilizes public opinion. By simply viewing the image, we begin to root for the woman in red and, by default, the protesters themselves. Brandon Thomas is an MA student currently living in Istanbul, Turkey. He can be contacted at kingblt@mail.sfsu.edu. It has been one week since protests over the planned destruction of a park in Taxim Square erupted in Istanbul and unleashed a virtually ceaseless flow of information, photography, and video footage over the internet. 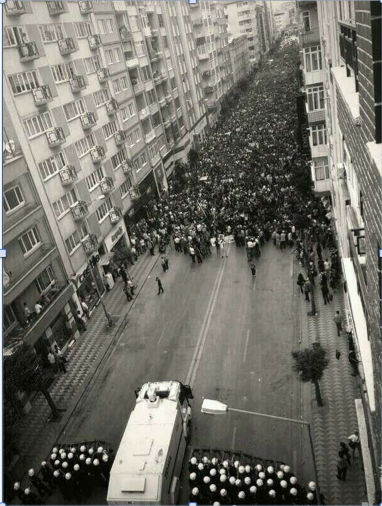 Twitter hashtags #occupygezi and #direngeziparki became top trending topics globally. Facebook updates switched from oversaturated bathroom selfies to ominous confrontation warnings and images of ‘biber gazi’ encounters. Reports of how the originally peaceful protest ignited into all night standoffs between police and civilians made headlines all over the world. Protesters read to police on the second day of a sit-in to save the Taxim Gezi Parkı, a small green space at the heart of Istanbul’s cultural center in Beyoglu. Though analysts may argue over the root causes of the movement, the view from the streets is much less complex. So far it appears that police use pepper spray and water cannons (and perhaps rubber bullets) to disperse otherwise peaceful crowds. People gather with flags and banners and signs attempting to march in support of other people with flags and banners and signs. They want to go somewhere, but they encounter a squad of police who say they must go home instead. This is the catalyst for conflict. People don’t want to go home, so they attempt to go forward. Police attempt to stop them. Conflict escalates, lines are drawn, words turn into weapons…. This continuous conflict plays out in the streets like trench warfare. An armored vehicle takes a position across from a scrap pile of debris drug together by a crew of protesters. Riot police fire pepper gas canisters and streams of water which disperses the crowd until the wind clears the fumes and they return back to the front lines alternately cheering, booing, and chanting anti-government slogans. It gets grittier though. Paving stones are pulled up and thrown. Graffiti is everywhere. Shop windows are bashed in. Sometimes there’s blood. Police standoff against protesters on a main street in Istanbul. The vehicle in the center is a TOMA, a riot control vehicle equipped with armored plating, bulldozer, roof-mounted water cannon, and a 150 gallon water tank. However, the protesters are not just the youth, the disenfranchised or the marginalized, but everyday members of Turkish society. I watched a fully covered teenage girl kick a gas canister down the street, a middle-aged woman squirt lemon juice in stinging eyes, a child handing out free sandwiches. Once, when the police advanced with particular severity, people were pushed out of the street and across a trim green lawn. When their backs were against the wall at the Hilton, the concierge opened the double doors and smiled “Welcome.” Inside, bleary-eyed protesters dusted off as the well-moneyed patrons tried to look casual and hide their surprise. 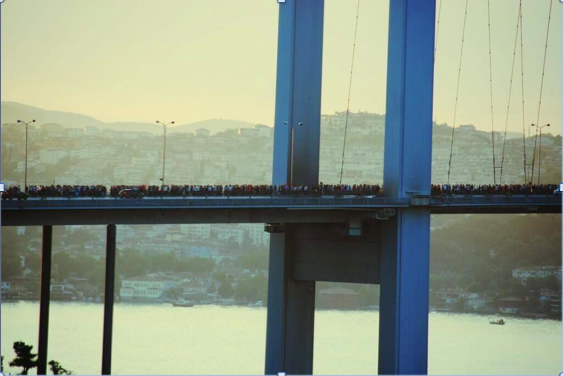 In the early morning of June 1, thousands of citizens marched across Istanbul’s iconic Bosphorus Bridge to join ongoing protests in Beyoglu. The almost universal solidarity is amazing to see. On Saturday police withdrew from Taxim Square. People were jubilant as they arrived. However they soon got restless with nothing to direct their anger towards and some got a bit destructive. A building was set aflame. Abandoned police vehicles were targeted for abuse. Still, the constructive protesters seem to outweigh the provocateurs. A bucket brigade was assembled to douse the fire. Time will tell if it’s enough to keep the movement’s credibility. 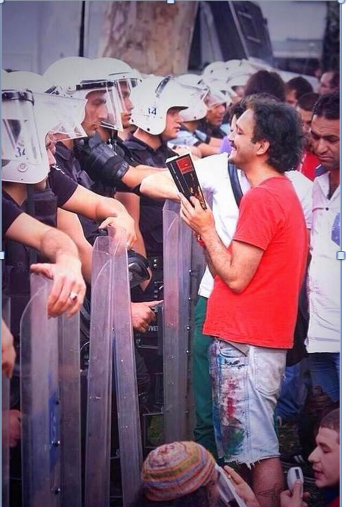 Anyway, these are the things going on last weekend in Istanbul. No one seems to know how important these events will be. Many people believe this is the beginning of the end of the current political party’s administration. Some think the military will intervene. After seeing the beauty and the horror of this powerful people’s movement, it’s difficult to say. Still, at the end of the day, the images speak for themselves and alternately tell stories of hope and anger, violence and peace. This transmediation, as useful as it is dangerous, shapes the process of interpretation and creates a visual shorthand for understanding events. 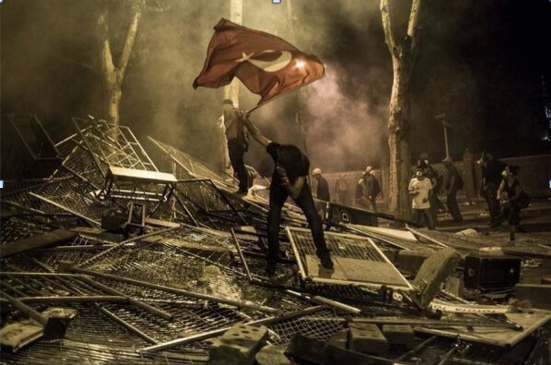 And like the future of the Turkish public, the way we will remember this past week in Istanbul remains to be seen. Wreathed in tear gas, a young protester waves the national flag atop a makeshift barricade on the streets of Besiktas. Brandon Thomas is an MA student currently living in Istanbul, Turkey. The author received these images through Twitter, Facebook, and various other social media sites. Like most viral images shared online, photo credits were not appended to the files. Any information on the photographers always is welcome. Is it a fake? Is it photoshopped? Is it real? Paul Hansen’s winner of the 2012 World Press Photo competition is just the latest example of more than 100 years of continuous discussions about the manipulation of photographs. However, instead of asking only if prize winning images are manipulated (and of course in some way they all are), we should also ask why are they changed to become the way they are? Or, to put it differently: what kinds of photographs win awards? When we look closer at the changing styles of the winning photographs since the beginning of the World Press Photo competition in 1955, we see that Hansen’s picture is part of a cinematic form of expression that has emerged in the last 6-7 years. 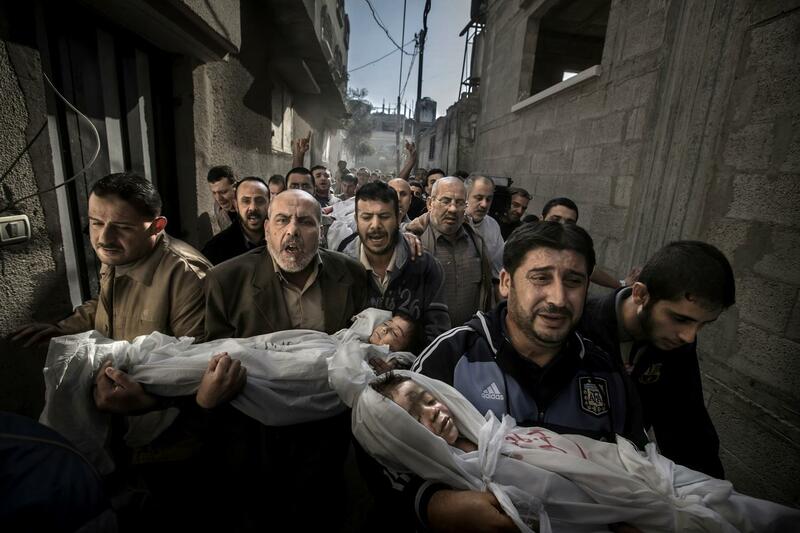 The image portrays family members from Gaza carrying the bodies of a two small children to their burial after being killed in an Israeli air strike. It is no coincidence that it has been called a movie poster. However, the photo is more like a still; a story frozen in time, but condensed with motion and movement, inviting us into a narrative of what has happened before, and what might happen next. This new trend is different from other dominant styles among the WPP winners. Some of the winning pictures hold what we can call news moments (similar to Henri Cartier Bresson’s decisive moments). Most of the news moments are from the 1960s. A prime example is Eddie Adams’ 1968 picture of the execution of a suspected Viet Cong member, showing the exact moment of the bullet’s penetration of the brain. The impact of the picture lies primarily in capturing a certain news event in a fraction a second. The closer we get to this century, the fewer pictures we see of such news moments. Instead we see more feature-like photographs capturing – not a moment, but a general situation or condition. Take this winner from 2004 portraying a woman mourning a relative after the Asian tsunami of December 2003. The photo is constructed around a juxtaposition between the dead body, represented by only an arm in the left of the frame, and the bereaved, represented by a woman lying face down on the sand in the right part of the frame. This kind of explicitly artistic visual rhetoric prevailed from 2000-2004. 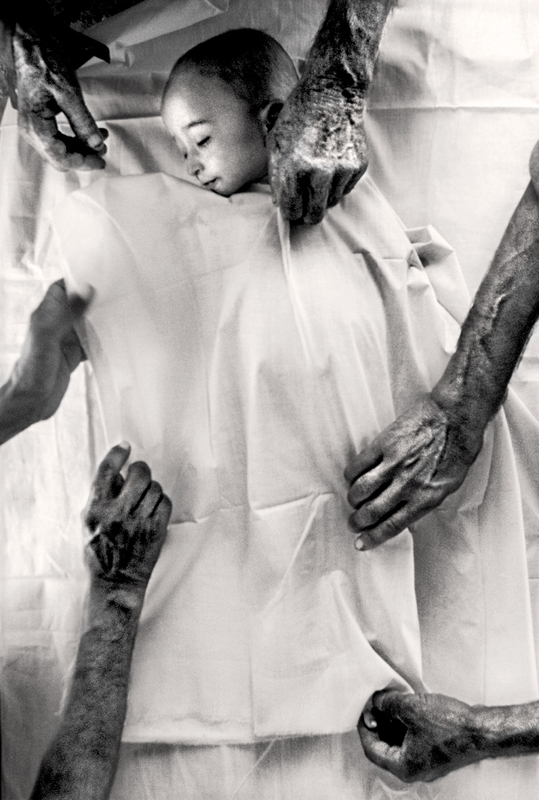 The 2001 winner portrays how the body of a one-year-old boy who died of dehydration is being prepared for burial at Jalozai refugee camp in Pakistan. It is a very rare example of a picture being taken in a full bird’s eye perspective, directly from above. The picture is dominated by the white color of the draping sheets, covering the body of the little boy, so we only see the left side of his face. He seems at peace, and the picture exudes calmness, giving it an almost ethereal dimension. Combined with the angle of the arms draping the sheets, the picture is more an aesthetic moment than it is a news moment. Hansen’s picture is neither a news moment nor an aesthetic moment – not to say, of course, that it does not have style. All images do. Instead the aesthetic tendency exhibited in this picture is a more of a kind of movie realism, a sort of photographic cinema verité. We see a similar tendency in the winners from 2007, 2008, and 2009. The 2007-winner shows a US soldier sinking onto an embankment in a bunker in Afghanistan. The 2008 winner depicts a policeman entering a home in Cleveland, USA, in order to check whether the owners have vacated the premises. In 2009 we see women shouting their dissent from a Tehran rooftop following Iran’s disputed presidential election. These images are not colorful, there are no close ups, no clear, simple or stylized compositions, and no conspicuous juxtapositions or an obvious use of some part to represent a whole. They give the impression of the fictional realism we sometimes encounter at the cinema. While the beginning of the decade presented photographs that have their main rhetorical appeal in their compositional and aesthetic organization, these photographs appeal more through story-making. The first kind invites the viewer inside the frame, encouraging exploration of the elements in the visual moment, captivating us through visual design. The second kind invites the viewer outside the frame, encouraging participation in the construction of a narrative, engaging us in speculations of what has happened and what will happen. This kind of neo-realistic press photography seems to be more open to interpretation than the more obvious symbolic photos. The strange thing, though, is that the more the pictures draw us into a story of mostly our own creation, they seem to draw us away from the events they are depicting. They are all fabulous images, but even when provided with the backstories I remain a spectator immersed in the story, in awe of the artwork, waiting for the movie to premiere. 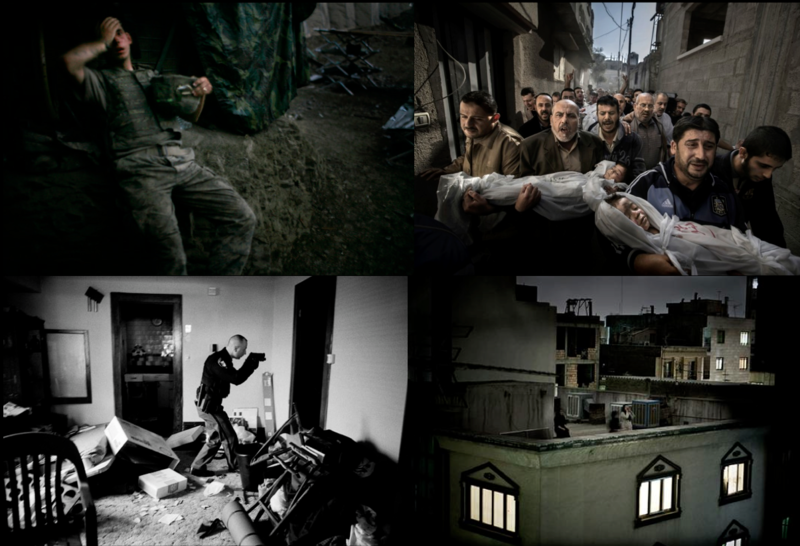 World Press Photo award-winning photographs by Paul Hansen, Arko Datta, Erik Refner, and (clockwise from the upper left) Tim Hetherington, Paul Hansen, Pietro Masturzo, and Anthony Suau. Jens Kjeldsen is professor of rhetoric and visual communication at the Department of Information Science and Media Studies, University of Bergen (Norway), and Professor of rhetoric at Södertörn University (Stockholm, Sweden). He currently is visiting Fulbright professor at the Department of Communication Studies, Northwestern University. A fair skinned white woman pivots casually in the middle of a crowded urban sidewalk, her hands tucked away inside mint green shorts. Her thumbs steadily line the top of her hips, as she casts a flat look somewhere beyond the frame of the photograph. And even though she occupies the center of the image, adorned with vibrant colors and tight fitting summer chic, her body is not necessarily the curious object of the photograph. We might keep our focus on her as we imagine what circumstances created this moment of pause—perhaps she’s a tourist taking in the sites or maybe even a fashion model. After all, her pose in this moving public space breaks with the uniform walking of the crowd behind her, dressed in black business suits and other muted tones. Yet, even though the camera invites our attention to her body, it also calls attention to the grimaced look on the face of the spectator to her right who fixates her disapproving gaze on the woman’s body. It is difficult to identify the valence of her expression. Perhaps she disapproves of such a bold aesthetic on a female body that violates norms of slender and seamlessness. Or perhaps it is a look of disgust generated by a body’s excess and its inability to be properly contained by standardized clothing. I encountered Hailey Morris-Cafiero ‘s photograph series “Wait Watchers” after a Facebook friend shared a blog link describing her project. “Wait Watchers” relies on the photographic potential of everyday life, and documents the encounters Morris-Cafiero’s body has with strangers in public spaces. After staging a camera in crowded public scenes, Morris-Cafiero waits to be looked at as the camera documents policing glances like the one above. As I scrolled through a number of photographs, I felt a stunning sense of familiarity in each scene, as a fat woman who also often catches the looks of others in public policing my muffin top. * The photos created a strong sense of identification with the experience of being looked at in such a way, and encouraged me to share the photos with my own Facebook network. Others “liked” and shared the blog as well, drawing comments from others ranging from the need to reflect on their own practices of public looking to the ethics of such an artistic project. But more, I was caught by repetition in the claim that the stranger in each image could be looking at something else, not necessarily directly at Morris-Cafiero’s body, and thus, not engaging in an act of ridicule with certainty. The desire for certainty of the alignment between relations of looking and being looked-at evokes what Ariella Azoulay terms a professional way of engaging with photography. The professional gaze seeks little more than to identify and categorize. However, even though Morris-Cafiero’s photo series asks for public witness to her experiences, to say the photos simply seek to shame the particular individuals caught looking on camera misses the project’s power. In this photo, one not featured in the initial blog, we gain a different sense of the stakes of the project. 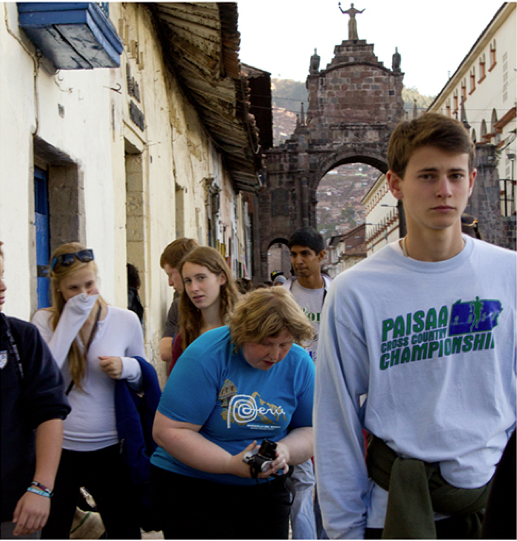 Here, the camera’s presence is manifest: two young teens moving through what seems to be a tourist space stare directly at the camera witnessing a crowded sidewalk. Here, their movements are as much on display as Morris-Cafiero, who seems to be adjusting the lens of her camera or bending her body towards the ground below her. Meanwhile, another young tourist looks in the direction of Morris-Cafiero, covering a smirk and an emerging laugh with her sleeve covered hand. The gesture demonstrates the limits of performing bourgeois propriety, as she attempts to contain and privatize what is likely to be an act of publicly shaming Morris-Cafiero. Both photos featured here draw attention to habits of looking that make bodies appear strange in public. More broadly, the project lends focus to encounters with bodies constituted as out of place because they violate aesthetic norms or because they violate dominant logics of how bodies should properly occupy public spaces. Morris-Cafiero’s body interrupts the efficient flow and movement of others on sidewalks or in alleyways as much as she violates fashionable gender regimes. And so even as the question of certainty animated by the professional gaze might motivate us to contemplate the motive of onlookers (is she really being mocked? 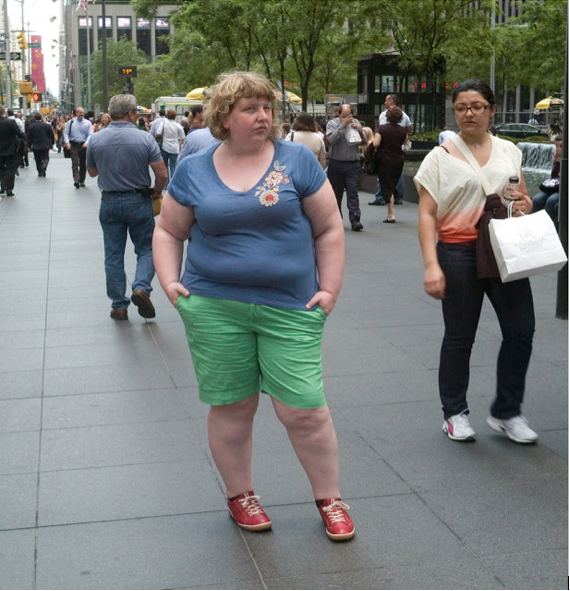 ), those questions matter less than how the photographic spectator is asked to intervene in the problem that the photo series suggests: how does one engage with the social relation of looking and lookism? Morris-Cafiero’s project illustrates how relations of looking can operate as both sites of surveillance of strange bodies for their laughable deviance and as a mode of looking back, making these disciplining gestures the object on display. By making relations of looking visible to photographic spectators, Morris-Cafiero’s is both spectator and actor. How one intervene in these two fields depends on the spectator. Because the photographic spectator is also witness to these acts, the question is, what is our obligation? The professional gaze is a possibility, yet it diminishes the potential of the civic as a mode of transforming the social conditions that make these looking relations possible. And so do we pity Morris-Cafiero? Empathize with the sheer banality of these moments? Shame the watchers? Seek compassion? We will have to wait and watch. *NOTE: “Fat” and “fatness” are often evoked as derogatory ways of describing bodies in gendered, raced, and classed terms. My use of these categories operates in tandem with writers, thinkers, and activists working to understand fat embodiments beyond the registers of medicalization and aesthetic norms. Emily Dianne Cram is a PhD candidate in the Department of Communication and Culture at Indiana University. She can be contacted at emcram@indiana.edu. It is campaign season again, that phase in the cycle of American political culture when candidates from both political parties stage over-the-top displays of patriotic grandeur: they salute flags, attend baseball games, eat hotdogs at state fairs or in corner diners, shake hands with the masses, and enact an array of additional public performances that are believed to enhance one’s public image. We are, in other words, moving from the circus of the Republican primaries to the carnival of the American presidential campaign. Given the ubiquity of hyperbolic theatrics that are so conventional to presidential campaigns, one might be taken aback by the above image. Taken just two weeks ago in Dearborn, Michigan by White House photographer, Pete Souza, the image captures President Barack Obama sitting solemnly inside of an empty, old-fashioned bus, looking intently out of the window and beyond the frame. At a glance, this is a puzzling image. Removed from the typical whirlwind of photographers, news reporters, and law enforcement, the President is seen here in a rare moment of solitude and private reflection. In many ways, the scene is neither spectacular nor conventional. It is only after reading the caption that we discover that the President is sitting in the very same bus where, almost 60 years prior, Rosa Parks refused to give up her seat to a white man, thereby igniting the Montgomery Bus Boycott and reenergizing the Civil Rights Movement. While it is understandable for viewers to interpret this image within a cynical register, there remains something incredibly evocative and moving about the image. 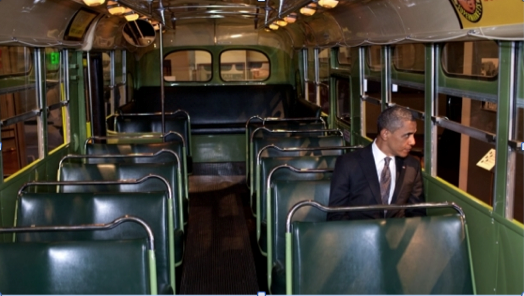 Indeed, the image emits an aura of authenticity – that is, it seems to capture a sincere and poignant moment where the President feels the gravity of the past and its bearing on the present or, more specifically, the role of Rosa Parks’ resistance to segregation and its relationship to the reality of Obama’s presidency. Rather than repeating the cliché and empty theatrics that saturate the campaign season, this image captures the President coming to terms with the fundamental fact that his presidency was made possible by those “second-class citizens” who defied a racist political system and executed acts of civil disobedience in hopes of realizing a more fair and equitable future for people of color. In short, the photograph serves as a history lesson insofar as it calls on viewers to recognize the role of civil rights struggles in having real effects (however oblique) on the vitality of present-day progressive politics. But it is not only a history lesson; it is also lesson about social change. 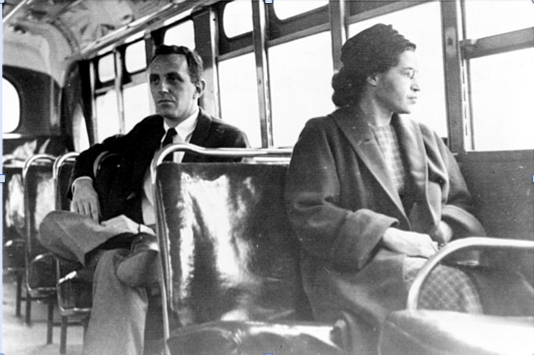 Seen here a year after the Montgomery Boycotts and the subsequent reintegration of the transportation system, Rosa Parks sits earnestly at the front of the bus alongside a visibly white passenger. The parallels between the image of Rosa Parks and the image of President Obama are striking: not only do both Parks and Obama occupy a space that was historically closed-off to blacks, but Obama unwittingly imitates the firm resolve suggested by Parks’ gaze. While the apparition of Rosa Parks reminds viewers that the Civil Rights Movement paved the way for a black man to serve as the President of the United States, she also reminds us that the vitality of contemporary democratic culture depends on the public dissent and civil disobedience of individuals and communities. One can only hope that Obama will take a hint from Rosa Parks – namely, that democratic promises are not always realized through compromises and civility; they emerge in the wake of overt and orchestrated political defiance. Bryan Thomas Walsh is a Ph.d student of rhetoric and public culture in the Department of Communication and Culture, Indiana University. Correspondence should be sent to btwalsh@umail.iu.edu. Literary and visual tropes of homecoming are essential to narrating war. Take, for instance, the timeless Greek war mythology of Homer’s Iliad and Odyssey. Both of these poems invoke the theme of “nostos” or homecoming. Or we might think of the iconic WWII image of the Times Square Kiss. Typically, homecoming tropes signify an end to a time of national conflict and strife—a relative return to normalcy. But the wars of the new millennium are perpetual. They resist narrative’s conventional markers of a beginning, middle, and end. 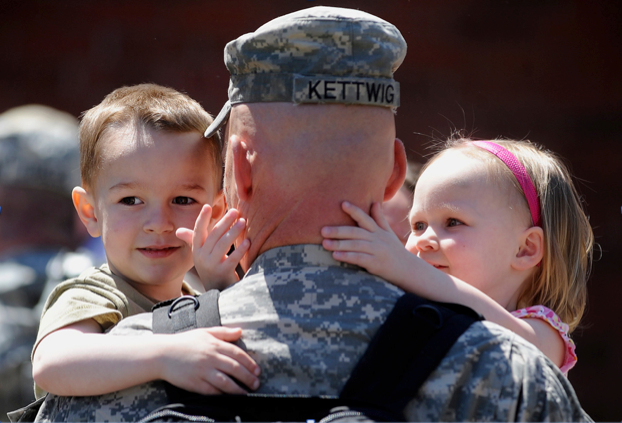 The image above was taken at a homecoming ceremony for the South Dakota Army National Guard’s 196th Maneuver Enhancement Brigade on May 3, 2011. It appeared in the Memorial Day collection of “In Focus,” The Atlantic’s news photography blog. According to the caption, the little boy in the photograph is four-years-old and the little girl is two. This means the boy was born around 2007 and the girl was born in 2009. By then, the war in Afghanistan had been underway for over five years and almost ten. These children were born into a culture where war is the norm. One year ago the little boy in the photograph was three; and the little girl was just one-year-old. In the image her hands lovingly and gracefully cup her father’s neck. She is not clinging to him, as we might expect a young child to do to her father. Instead, her head is pulled back from his. She gazes at his face with a mature, furrowed brow, a look of relief, concern, and wonderment, commonly identified on the faces of adults. She has not seen this face in one year and she appears to be studying it, searching for traces of change since the last time she saw it. It reminds me of the way parents look at their teenaged children after their first long stint away from home. But her father does not return her gaze. He appears to be looking at his son. The son, who is four-years old, stares off into the distance over his father’s shoulder. His facial expression is less engaged than his sister’s. His lips part and turn upward, but the smile looks almost hesitant. Perhaps he has experienced this homecoming scenario before. Maybe, by his ripe old age of four, he has experienced his father’s deployment and return once already. The boy wears a green tee shirt, almost identical to the color of his father’s desert camouflage. And his short, clean haircut adds to the father-son likeness. As the father looks at his “mini-me,” the reader is invited to wonder if military service is in this little boy’s future. So as the father looks at his son, and the son looks off into the distance, and we, the viewers look at these children, all of the gazing that animates this image is oriented toward the future. While the children are the most salient figures in this photograph, with their adorable, round faces and the light bouncing off their shiny, sandy blonde hair, the father figure is positioned as central. However, it is the back of his shoulders, neck, and head. We cannot see his face, and as such, we have a harder time identifying emotionally with him. We can only imagine what his face looks like. Does it express happiness? Relief? Melancholy? The back of his head does not provide cues for how we should feel. Perhaps the absence of his visage marks a loss of his humanity while at war, or perhaps it symbolizes an anticipation of his death, or maybe it’s a social commentary on what has been described as a faceless war effort. The photograph’s composition is an uncanny inverse of Dorthea Lange’s Migrant Mother. Instead of identifying with the mother — or the absent father figure — as we might have with Lange’s image, this photograph turns our attention to the children’s faces for a model of how to feel and how to interpret the action in the scene. This important shift in subjectivity positions the viewer as childlike—an infantile citizen who, like the four-year-old and two-year-old in the photograph, has become a little too acclimated to a culture of perpetual war. When we take on the gaze of the confused and bewildered child, we as citizens are invited to remain complacent and uncritical. Again. Lisa Carlton is a Ph.d student in Communication Studies at the University of Iowa. She can be contacted via e-mail at lisa-carlton@uiowa.edu. While ruin gnaws at the promises of American democracy, photography serves as an invaluable technology for visualizing our increasing vulnerability to social and political abandonment—and just maybe for defending against it. Consider the above image of a classroom in Detroit’s St. Margaret Mary School: empty desks are scattered throughout, littered course papers amass on a burnt and charred floor, lectures and exam dates are faintly scribbled on a chalkboard, closets are stripped of their possessions, windows are broken and boarded-up, lighting fixtures dangle from a moist and moldy ceiling, and what appears to be a broken ruler lies on top of a desk in the bottom right of the frame. Despite being reduced to rubble and debris, the objects are nonetheless glaringly clear. The wide-angle offers a perspective to the viewer that encompasses the totality of the classroom while the deep focus enhances the details and intricacies of the landscape and its objects. The composition of the photograph effectively brings the space to life, offering all its complexity to the careful contemplation of the viewer. But what does this photograph want us to contemplate? Note the spatial layout of the remnants of the school: the chalkboards, windows, papers, closets, and most of the desks are relegated to the periphery of the room. Complimented by the circular formation of the desks and the directionality of the lines on the windowsills and chalkboards, the fallout of the classroom orbits around an invisible but nonetheless noticeable center. Indeed, there is something missing here and the photograph renders it a ghostly presence that glares back eerily at the viewer. Put bluntly, St. Margaret Mary School is haunted by the everyday activities that once animated it. Even if you didn’t live in northwest Detroit, or attend Sunday services at the St. Margaret Mary parish, or endure lessons taught by an Order of Sisters, the landscape and its remnants are identifiable for most Americans: I once sat at those awkward desks and wrote childish nonsense on those papers; I gazed in reverie through those windows; my teacher scribbled on those chalkboards and demanded my attention with that ruler. In short, this photograph displays a powerful paradox: what is so overwhelmingly visible within these spaces is also what is so painfully absent–the everyday activities that sustain and are sustained by a flourishing and hopeful city. Despite its collapse, this photograph of an abandoned classroom in the St. Margaret Mary School calls forth the memories of a more promising past. Such is the topic of concern for Yves Marchand and Romain Meffre’s photographic project “The Ruins of Detroit.” Depicting Detroit’s dilapidated metro-stations, schools, theaters, banks, industrial facilities and other civic spaces, Marchand and Meffre’s photographs invite a range of interpretations that put past and present in tension with one another: they could evidence the extent of Detroit’s civic and infrastructural abandon, or that of a weathered and beaten civilization, or for that matter they could even foreshadow the impending doom of American Empire. Invoked by the images, such memories are nostalgic and mournful, at least insofar as they eulogize a flourishing cityscape buzzing with prosperity and modern mass production. Detroit now stands (leans?) as a veritable wreckage of infrastructural and social disaster: not only have a quarter of its population fled the city in a desperate search for employment, but city officials and enforcement agencies have displaced families from their homes and boarded-up entire neighborhoods, leaving it in nothing less than a thorough state of collapse. Just last spring, roughly 5,500 teachers and 250 administrators received pink slips, while seven public schools have been shutdown, and 45 others have been packaged to charter school developers, 18 of which will be closed if they don’t find a buyer. 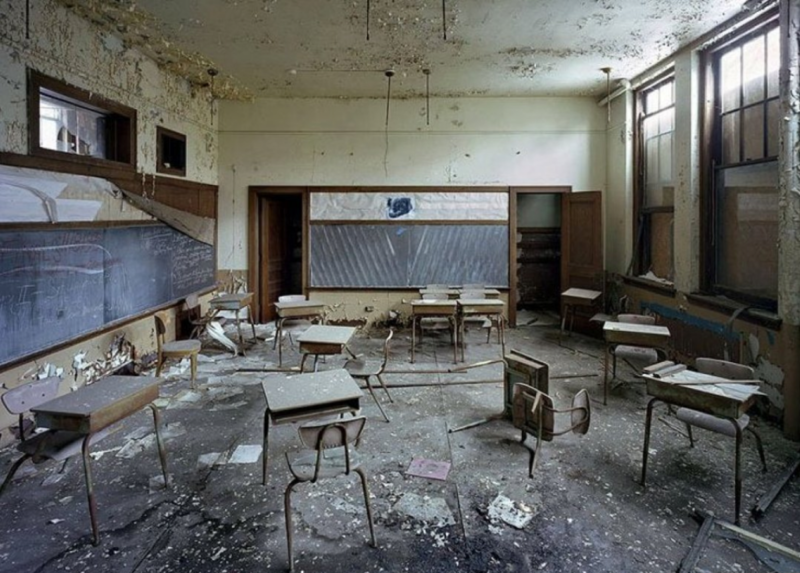 This photograph of a single classroom in the St. Margaret Mary School does not tell this part of the story, but it does provide resources with which communities can make sense of—and intervene in—the perpetuation of personal injury, social inequity, and political abandonment. The image, then, does not “exploit a city’s misery” through a “decontextualized aesthetics of ruin”; rather, it tangles the past with the urgency of the present, reminding viewers to acknowledge both the vulnerability of the people of Detroit as well as the imperative to do something about it. Bryan Walsh is a graduate student in the program in Rhetoric and Public Culture, Department of Communication and Culture, Indiana University. He can be contacted at btwalsh@umail.iu.edu. Seeing dirt in combat zones is nothing new. In accounts of combat and its aftermath, terrain becomes a living entity, both working in terms of physical contact and mystical dimensions. The grounds are alive, swallowing bodies in rice fields, suffocating men in trenches, and blinding convoys in deserts. But they also offer places to cling to at the screams of a falling mortar round. It is a sordid relationship, cyclical in nature, turning to dirt for safety and death, sorrow and elation of near misses. There is a constant movement to and from the earth, going to it for safety and attempting to control its unruliness with concoctions and machinery, trying to keep tabs on it so it does note betray you. Drawing lines in the sand with barbed wire is one such consistent method, as seen above. The earth shakers on the highway in the background rumble by on pavement paying little heed to the mounds and bushes to the side. Their pace is consistent as the space between the personnel carrier and the two other vehicles is fairly even, a measured and rational approach to traversing landscape. They blur into the horizon with a linear direction and time. The soldier nearest us wears no gloves, perhaps a sign of confidence and experience in the dirty work of war. Not rushing, he bends over at the right distance so as not to be cut. The gun is slacked on his back. 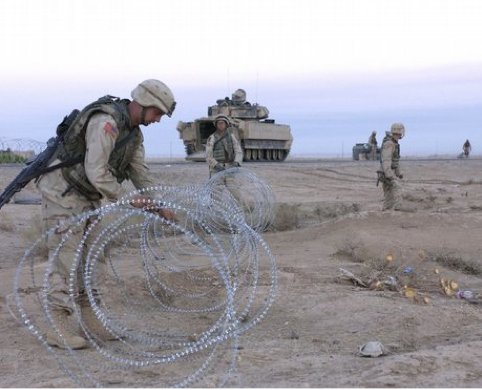 The pace and direction of the action is somewhat contradictory to the convoy, as there is a sense of care in the arrangement of the wire, a ritual that serves to form barriers between bodies and space, safety, and danger. The wire then works as a frame, a barbed optic and cordoned view through which combat is expressed. We might surmise that the optic changes post-deployment when treatments are scheduled and predictable, away from the dirt of the body, cleansed of pollution, pieces of trash stuck by barbs. The move is away from the dirty work of war. Maybe. 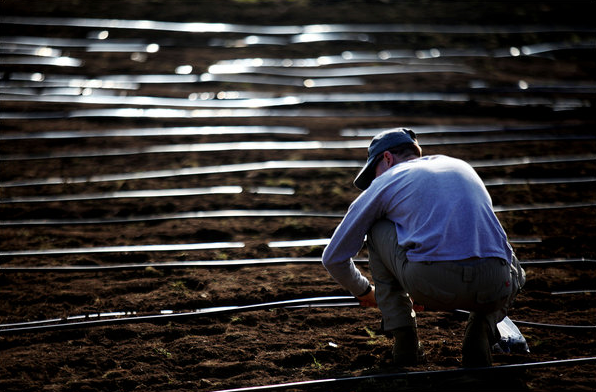 This image is part of a NYT slide show that accompanied a story about a veteran transition program training combat vets in organic farming. Literally framed in terms of “dirty work,” the article cites a “veteran-centric” farming movement. 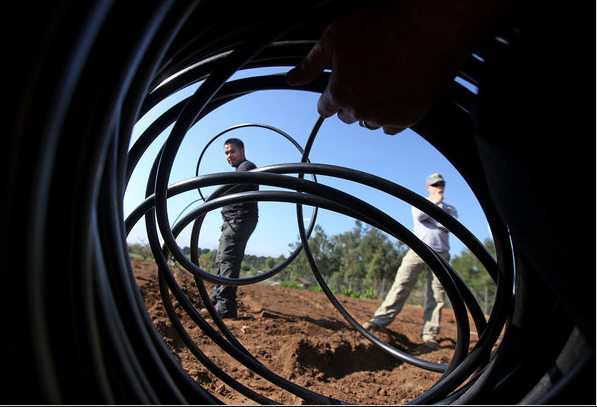 The “centric” thematic should not be ignored here, as now irrigation hoses, circular, yet tangled, frame our view of both men. Soldiers still work to roll out and arrange, the optic is similar, but the relationship to dirt is much different. The men maintain relaxed yet focused poses. The barbs are gone, but not the suspicion. One looks directly back through the circle, the other ponders, arms folded, looking off to the distance with an air doubt. The rural setting, tree-lined fields and fertile soil, its pace, and farming’s inherent concerns with seasons of circularity rather than linear narratives of completeness provide an optic through which we might reconsider hyper-rational cleansing narratives of post-combat trauma. Here there is a circular patterns in which sorrow of death and joy of life are connected, where physical contact with dirt can be joined with mystical elements, linking bodily and soulful healing. Such a cyclical approach to wholeness is not an escape from dirt but a shift in relation, from a season of wilting to a season of cultivation and rejuvenation. Seeing the combat narrative this way then is not a story of Homer’s Odysseus and the treacherous journey from Troy to an end of the Odyssey, but an echo of the Hymn to Demeter. Demeter was one of the earth gods in whose name a civic festival celebrating the cyclical nature of joy, sorrow, earth, agriculture, cultivation, and rejuvenation sought to change relationships to life and death, body and soul. The earth, like Demeter, knows mourning and elation, and as such, rituals that joined these were deeply rooted in the rural, agrarian Mysteries of Eleusis, secret rites in which initiates’ were changed through experience of “kinship between soul and bodies.” Rather than looking up, yearning to flee pollution and clean dirt from hands, changing our gaze only slightly reveals another optical style where unwinding wire brings us full circle, turning approaches to trauma to chances for labors of focused, relaxed, contingent, patient, and seasonal soiled work of rejuvenation. Similus similibus curantur, loosely “relief by means of similars,” by means of unwinding coils of separation. Jeremy Gordon is a graduate student in the program in Rhetoric and Public Culture, Department of Communication and Culture, Indiana University. He can be contacted at jeregord@indiana.edu. Despite the Great Recession and the escalating rates of both poverty and economic inequality within the United States, finding images of poor Americans within the news often feels like a process of excavation. There is a curious deficit of photographs of the 44 million Americans living in poverty, and in lieu of using photographs, many articles on welfare or economic inequality feature graphs and charts. One result in a dominant framing of poverty as a purely economic category rather than as a condition of life. One of the few photos that I have found accompanying an article about poverty is this image from Time Magazine’s blog. 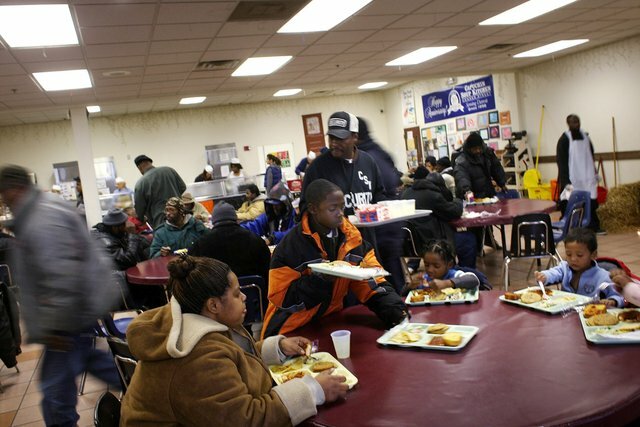 Taken at a soup kitchen in Detroit, the focus is primarily on the family sitting at the table in the bottom right of the frame. The background subjects are blurred, creating a sense of a rushed, noisy environment surrounding the family, and yet the large open space of the maroon table offers a small sense of calm. But the photograph also is off-center, tilted, and unfocused, and thus it captures the incongruity of the private, domestic ritual of a family dinner occurring in a public setting. By positioning the viewer slightly above the edge of the table as if about to take a seat, we are invited to imagine poverty as the backdrop of an otherwise normal life. In response to the limited numbers of photographs of U.S. poverty within the media, a group of photojournalists joined together to create AmericanPoverty.org as a shared space to publicly document the lives of the poor. The website automatically opens with a short slideshow of photographs accompanied by dramatic music and text. Opening with the phrase: “For decades American poverty has been invisible,” it then quickly cycles through several images, mostly of children and families, before pausing on an image of a young, white girl in front of a trailer house. Here text emerges, saying, “It’s not invisible anymore.” The photojournalists’ goal is that by rendering visible what has been invisible, viewers of the photographs will demand social change. This appeal to potential advocates is present in the choice of photographs for use in the slideshow. All of the photos are of sympathetic subjects such as children and families. Many of the images feature the subject, usually a child, looking directly at the camera as if asking the viewer to see them. These subjects demand a response from the viewer—by virtue of both their embodiment of the large-scale realities of poverty and economic inequality and their identity as equal citizens living unequally. One of the more engaging photographs within the video is this one of several children playing in New York. The primary focus of the photograph is the reflection of the boy in the middle. His face is serious, his eyes intently focused on the reflective surface before him. This use of the mirror mimics the active work of photography by providing an image of a moment that seems to be of reality, while also announcing the existence of the apparatus that can only provide a partial and fractured glance at its subject. The camera’s position is aligned with the boy’s, making what we see within the photograph representative of his viewpoint. 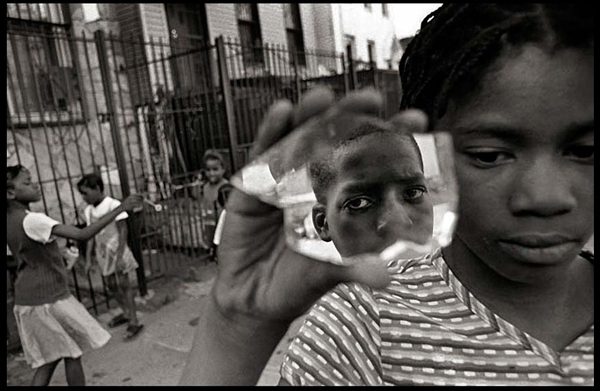 The photograph reveals a moment of American life, and our own understanding of it, to be as fractured and incomplete as the boy’s reflection. In contrast to the boy’s resistant gaze, the girl who holds the mirror is downcast. In the literal sense, she is showing us (the boy, the photographer?) something: a piece of broken mirror. She is also revealing the sad resolve of the boy’s reflection, the proof of poverty’s withering effect on the soul, and the loss of a happier childhood being modeled by the three children playing behind her. The children in the background are playing with bubbles next to a tall, metal fence. The combination of the fragility of the small children and the bubbles with the harshness of the broken mirror and the prison-like connotation of the gate results in a sense of unease. The happier moment playing out in the background seems destined to disappear as the harsher realities of life reveal themselves in ever sharper relief. Both of these images point to the ways in which poverty transforms the daily activities of life into moments that are both familiar and foreign. They produce a sense of dissonance through the combination of familiar practices with the realities of need. The ritual family dinner becomes displaced by the family trip to the food kitchen; playtime involves bubbles and broken pieces of an automotive mirror. These photographs not only attempt to render visible what is invisible; they also try to render legible the normalcy of poverty. By illustrating scenes of daily, familial life, viewers are encouraged to both identify with their familiarity and be horrified by the inequality they unveil. Unlike the graphs and diagrams that so often stand in for the visual experience of American poverty, these photographs draw upon powerful values about family life, the protection of children, and our shared sense of horror at their violation. They also challenge the ideology of American exceptionalism and the promise of liberal democracy to provide a high quality of life to all of its citizens. And perhaps this is the real reason that these images and these people remain invisible—they are American yet they trouble our sense of just what that means. Photographs by Spencer Platt/Getty Images and Brenda Ann Kenneally. Rachel Rigdon is a graduate student in the program in Rhetoric and Public Culture, Department of Communication Studies, Northwestern University. She can be contacted at rigdon@u.northwestern.edu. Carnival Citizenship: Chaos … or Clarity? It is difficult to remember that times of chaos can also be times of clarity. Let me put it differently: it is easy to forget, amidst endless reports of political turmoil, that we are in a season of carnival. Above is a photograph from the 2011 Vevcani Carnival in the Republic of Maceodnia. The image typifies the comic spectacle of the carnival tradition: the flouting of everyday decorum, the licensed (and licentious) freedom of excess, the transformation of violence into grotesque sport, and the unhampered celebration of sarcasm, irony and satire, all of which define the “carnivalesque” and defy the “seriousness” of officialdom. The caption indicates “[a] disguised reveler…in a carnival procession.” Considering the leather strap embracing his neck, the idea of revelry is jarring. Of course, the frontal angle levels our perspective and invites us to view from within the procession and, despite the obvious and potentially repulsive nature of the man’s captivity, let alone his grubbiness, we are drawn in by the gaping grin on his face. He laughs, but we get a sense that, if he can laugh at his own imprisonment, so can we. 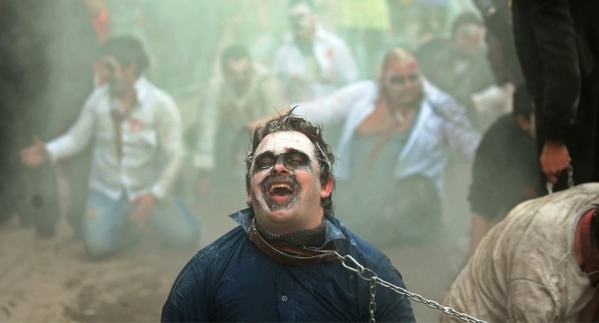 Although the background is a blur, we can see that everyone is reveling—even, presumably, the erect figure in black who is barely visible and who likely clutches the chain linking the loose collars around the men’s necks. A man on his knees gestures at an unseen audience member (a child, perhaps?). A huge man, who evokes the giant Gargantua himself, balances his girth in glee. Together, they reveal a wending procession of interconnected actors and in it we find a peculiar ritual performance, reliant on an equally peculiar logic of liberation. But in all its debasement, in all its irony, it depicts a certain peace. Citizenship, which is defined by at least some measure of restraint (if not constraint), is momentarily defined by the erasure of boundaries. Individual bodies merge into a larger collectivity, and the tensions that build up and beg for release are expelled. Furthermore, bodily expressions and social excesses are given time and space to simply be. It is said that the Vevcani carnival owes much of its popularity, not only to the actors, but “to numerous journalist teams, cameramen, and photo reporters.” It is telling, then, that there is such a relative dearth of carnival images in U.S. popular media. Perhaps we in the U.S., think of carnival only as Mardi Gras or the popular cruise line. Still, many civic carnival traditions persist. Few, however, retain the customary excesses of Vevcani and its 1400-year history. We might ask ourselves then: are we too overtaken by the “serious”? Shouldn’t carnival be an important aspect of civic life? Donning their masks and costumes, many carnival participants say they become themselves while in character. Perhaps we under-value the clarity that might come from more carnivalesque ways to commune. Photo Credit: Robert Atanasovski/AFP/Getty Images. Chris Gilbert is a graduate student of rhetoric and public culture in the Department of Communication and Culture, Indiana University. He can be contacted at cgilbie@gmail.com.